OCULi is a product range of battery powered wireless PIR motion sensors which have integrated colour/monochrome cameras and infrared illuminators. These products prove rapid visual verification of alarm events using the mobile phone 3G network. A dedicated cloud server and web portal provides a full monitoring system as well as an easy way to set up and control the detectors. Alarms and alerts are sent to the OCULi mobile phone app as Push Notifications as an alternative means of monitoring. OCULi uses the mobile phone 3G network and can be sited anywhere there is a network signal available. Simply sign up to SIM usage on a rolling monthly contract and you are ready to go. (SIM price includes the use of the cloud server). Images are streamed over 3G giving exceptional speed and quality of delivery. Connection time to the network using our roaming SIM is fast and non network specific so the strongest signal will always be used. All video & data is stored on the SD card and cloud server until it is deleted by the user. PIR detection range is 15 metres x 90° using a Quad Pyro Sensor and falls well within the camera’s field of view of 135° to ensure detected movements remain in view. Bluetooth® facilitates easy set up using the iOS app to determine signal strength, camera view and PIR detection coverage. Sensitivity, pulse counting and AND gating are all configurable using the App or web portal. Each OCULi detector is programmable to automatically set and unset up to 3 times per day on a 7 day timer. On site Arm/Disarm can override the automatic schedule by using the OCULi iOS App. Quad pyro technology minimises false alarms and ensures superior detection performance. 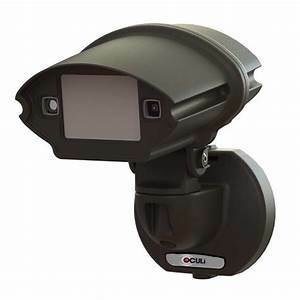 OCULi is fully tamper protected with IR anti-masking, 3 axis inertia sensing and enclosure tampers. TimeLine video® feature ensures that the product is working correctly and provides an extra level of surveillance. The OCULi online web portal is a full monitoring platform for use with your OCULi units. It allows you to view footage captured by your units, add different sites, change the unit settings, assign new users and keep track of your SIMs and data usage. You can also choose which notifications you want to receive from your units and how frequently, as well as how sensitive the PIR is and how often the unit is allowed to detect. The OCULi Mobile App is a powerful tool that allows you to receive alert notifications directly to your phone. You can see what type of notification was sent (ie. detection, move) and watch the footage captured during the event. The Mobile App also doubles as a Walk Test instrument using Bluetooth, allowing you to arm and dis-arm your units, as well as have them take an image on demand. This makes the installation process quick and easy.